Sierra Office Supplies and Printing has been an important business partner of the SVALA for many years and has personally helped me drastically reduce supply costs for my firm. Several years ago I was pulling my hair out when the supply vendor I had used for years repeatedly changed my rep and, after several tries, didn’t listen to my concerns about service and price. It was difficult for me to switch supply vendors because loyalty is important to me and I wanted to stay loyal to the company I had worked with for several years. However, they were not helping their case! I eventually interviewed competitors, one of which was Suzie Schuenemann of Sierra Office Supplies and Printing. I talked with Suzie about office supplies and my goal of working together to keep costs to a minimum without sacrificing quality or efficiency. I stressed the importance of communication so we could keep costs in check and supplies in stock (even on a rush basis). Suzie and Kim Pablis worked as a team at that time and they both assured me they would do everything possible to fulfill those goals. We have been loyal customers for over eight years and Suzie and Sierra Office Supplies and Printing have been loyal supporters of the SVALA for at least that long. Sierra Office Supplies and Printing also sponsored the SVALA November luncheon and Bill talked about developing a comprehensive branding and identity management package for our firms. Bill focused on print collateral, advertising as well as informational materials and specialty items for a firm’s marketing team. Suzie recently took time out of her busy schedule to answer our questions for the Business Partner Spotlight feature. 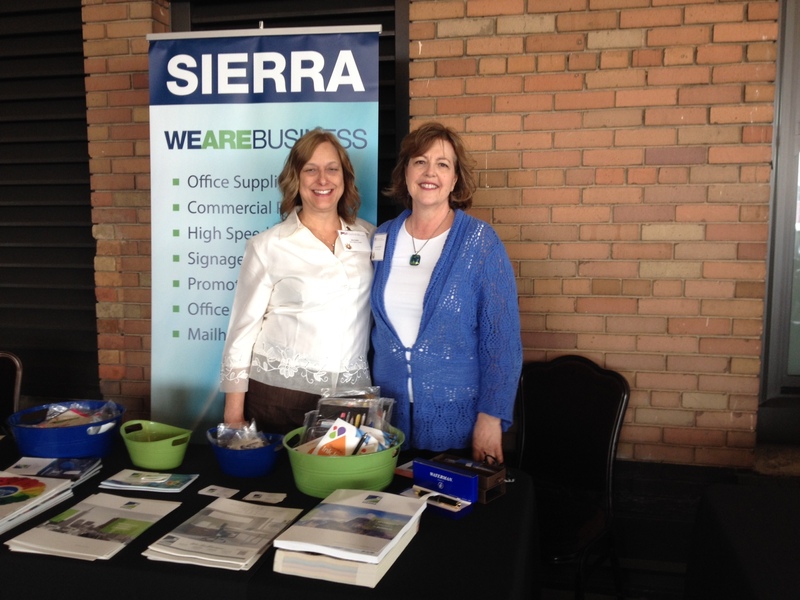 A locally owned and operated business since 1981, Sierra values the importance of partnering with the local business community. Our expansive product lines and service capabilities fit well with the dynamic and deadline oriented needs of the law firm business environment. We believe it has been and will continue to be a valued partnership. Additionally, the SVALA members are a fantastic group! Please tell us about Sierra Office Supplies and Printing and the services you provide. With offices, printing facilities and distribution in Sacramento and the Bay Area, Sierra has become a leader in the office supply, printing, furniture, signage and promotional industries. Sierra is committed to create partnerships with clients and develop a “One Resource Solution” to the constantly evolving office environment. Give us a little background about yourself. How long have you been in the business? How long have you been with Sierra Office Supplies and Printing? I am a Sacramento native, born and raised in Fair Oaks. My son and his family live in Sacramento too. I started in sales in the late 1980’s as a facsimile salesperson. Remember those old thermal fax machines, the one with the roll of paper?! In the late 1980’s this was new technology to the marketplace; potential clients would say to me “great idea but who would I send a fax to?” It was a fun and rewarding entre into sales. Most of my clients were law firms at that time too. In 2000, I joined Sierra’s team and over the last 16 years I have been fortunate to forge many long term business relationships with so many of you. For that I am very grateful. My mantra in business is that “people buy from people they like and they trust” and I have always strived to meet that expectation. I believe law firms are somewhat unique in that often times they are more deadline oriented, most likely due to case timelines. Law firms also have unique and specific office supply needs such as legal index tabs and specialty folders. To meet that need, we now stock in our Sacramento warehouse many items specifically for the law firm environment and for next day delivery. I guess I am somewhat of a workaholic. Customer service has always been very important to me. With today’s technology it makes it easier to be quick and responsive to my customers needs. I remember years ago a conversation I had with the Telecommunications Manager for Cable Data, which was the billing arm for Comcast then, and he was lamenting about how customer service in this country was sorely lacking and that he appreciated my attention to timeliness and detail. That drives me, the opportunity to exceed my customer’s expectations whenever I can. I have a darling 6 year old grandson, Ryder, who I enjoy spending time with every chance I can. Having him spend the night is one of my favorite things to do. We catch up on what he’s been doing, watch movies, play games and bake cookies. He has a little sister on the way early next year and I couldn’t be more excited. I am also an avid gardener. I bought a house 14 years ago that had an extensive perennial garden that I have enjoyed tending and watch mature. Some of my winter bulbs are just now starting to pop up! I also enjoy taking long walks, camping at the beach, and visiting with friends over a nice dinner and good bottle of wine. What do you want the SVALA members to know about you and Sierra Office Supplies and Printing? On behalf of all of us at Sierra, we would like to extend our gratitude for the opportunity to continue over many years as a Platinum Sponsor of the SVALA. We are committed to helping the law industry in all facets of business to include office supplies, printing, furniture, signage and promotional. I am particularly grateful to have made so many wonderful friends in the law firms that I support. My job wouldn’t be the same without you! Many thanks to Suzie for her stellar work with many local law firms and for being an ardent supporter of the SVALA. Suzie is spot on with her philosophy of “people buy from people they like and they trust.” Having known Suzie for so many years now, I know she is a likeable person and certainly one I trust to give my firm wonderful service at an excellent price. Looking forward to seeing Suzie and many SVALA members at the Holiday luncheon this week! Next postSVALA Holiday Party: Fun Times!